Fryes and Platforms; a Continental Divide? So the platform boots were there, but were strictly the preserve of specialist stores. Compare this situation to what you see in the UK. First appearing in 1972/73, by the following year they are easily the most popular style of boot, making up more than 60% of the pairs on sale. From 1973 to 1975 the platform ruled supreme, and if you include the mid-seventies knee boot, with its somewhat lower sole in the same category, then the platform sole was the dominant feature of footwear for most of the decade. Meanwhile, the U.S. had its own distinctive style of boot.“This winter,” Ann Roiphe wrote in the New York Times in January 1976, “in the cold climates, every boy and girl from 13 to 22 will be wearing a down jacket and Frye boots.” The Frye boot had first become popular in the winter of 1974/75, but it had taken time for the word to filter through to the buyers in the big stores. Now they were everywhere. 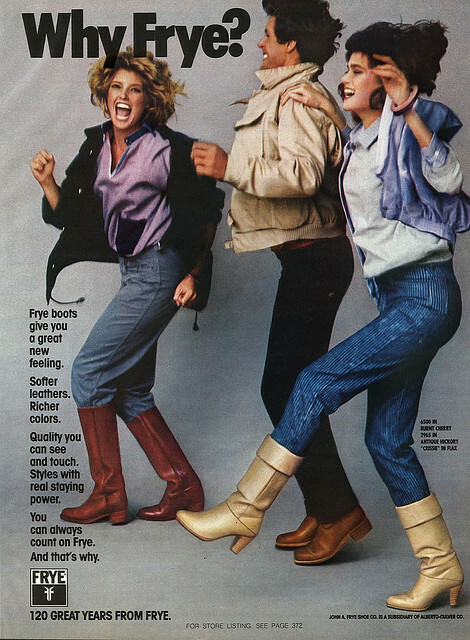 If you’ve been reading this blog for a while, then you’ll have realized that the transgressive thrill of adopting a previously male-dominated mode of fashion was one of the main drivers for the evolution of the women’s fashion boot, and that was certainly the case for the Frye, which was very much a unisex boot in its seventies incarnation.As Roiphe notes, unisex dressing invariably tends to move in the direction of becoming more masculine. Women used to want their feet to look dainty, but in the mid-1970s this was apparently no longer the case. So here we have the big split in the evolution of the boot during the 1970s. Close-fitting, ultra high platform-soled boots in the UK (and the rest of Europe); heavy, baggy Frye boots in the US. I first noticed this with prompting from Bruce some months back, and I’ve been chewing it over ever since then. What was the reason behind these differences? At first, I wondered if we were looking at some fundamental difference between the U.S. and the U.K. I (semi-jokingly) suggested on Bruce’s blog that it was all to do with reaction to the societal malaise at the end of the Sixties. The U.K. chose to escape into the 1930s nostalgia of Biba and the platform-soled shoe, while in the U.S. they tried to recover the simplicity of life on the land, through a resurgence of interest in things like country & western music and western-themed fashions. But to do this, you’d have to assume that there’s some measure of equivalency between the Frye boot and the platform boot, and the more I read Ann Roiphe’s article on the Frye, the more sure I became that they were not really reflections of the same phenomenon at all. The UK platform boot – at least in its female incarnation – is closely linked to the equivalent, close-fitting fashion boots found in the U.S. during the same period. There are certainly some differences, but while many of the U.S. boots look similar to Frye boots, they are not actually Frye boots. They are fashion boots that incorporate Western themes. The actual Frye boot and its derivatives, of which the Campus boot is probably the best known example, was a unisex working boot, co-opted for the purposes of fashion, and worn primarily by the young – teens and co-eds. When women wore it, the boot was an outright rejection of feminine footwear in favor of something distinctly masculine – as Ann Roiphe pointed out, this unisex fashion was a distinctly one-way affair. So if you look for the equivalent boot in the UK, I would argue it is not one of the regular women’s boots, platform soled or otherwise. A unisex, but mostly masculine working boot worn almost exclusively by the young… surely we’re talking about the Doc Marten boot? Docs are probably the last style that would come to mind when you think of the term fashion boot… but plainly Roiphe (and many of her contemporaries, one assumes) thought the same about Frye boots. And Docs were most definitely a big part of two of the biggest youth cults of Seventies Britain, the punks and the skinheads, where both men and women wore them. When I first thought of this, it seemed crazy. The worlds of punk and – say – country are about far apart as you can get. Except that there’s a case to be made that both were a reaction to the slick, stagflated world of the 1970s. Punk was anti-authoritarian, stressed individualism, non-conformism, and self-reliance. It was also left wing and progressive. In the US, by contrast, the 70s saw the rise of the conservative right, which adopted country as one of its cultural touchstones. But while it was at the other spectrum, politically, this movement shared some value with the punks; it was also individualistic, anti-establishment (in the sense of the old, East Coast ascendancy), and self-reliant, with an engrained suspicion of government. Fryes started out with the post Woodstock college kids, but they gradually became part of the mid-late seventies resurgence of fashion rooted in Americana – denim, gingham, country music, God, and the American flag. So instead of a simple U.S./U.K split, we have an establishment/radical split. The fashion boot grew up in the mid 1970s and left its original, “youthquake” audience behind. Or, rather, they grew old and their boots matured with them as they joined the comfortable middle classes. In their place, a younger generation of boot wearers looked for something that was more challenging, either because it presented an extreme version of female fashion (the platform boot), or because it abandoned female fashion altogether in favor of a more defiantly unisex (or masculine) look. In the UK, the Doc Marten represented this latter trend: in the U.S. it was the Frye boot. This is not to say that because the Frye boot started out as unisex, it always remained that way. 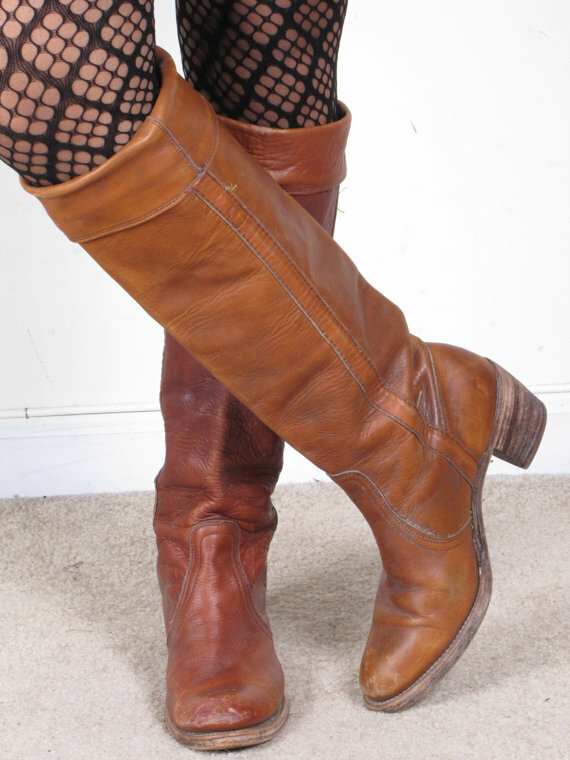 Just as the wider story of the fashion boot is one of the co-option of masculine working dress as female fashion, the Frye, in its feminized version, was one of the earliest examples of the whole range of “casual boots” that are so popular with women today. We looked at this last year as part of the comparison of boot styles and we’ll discuss more when we get into the 1980s. Nemy, Enid, 1974. Boots have changed – especially in price: droopy look. New York Times, Sept 20, 1974; p.47. Roiphe, Anne, 1976. Tweedledum and Tweedledee. New York Times, Jan 26, 1976; p.256. Sandbrook, Dominic, 2012. Seasons in the Sun: the Battle for Britain, 1974-1979. London, Allen Lane; 992pp. Schulman, Bruce J. 2001. The Seventies: the Great Shift in American Culture, Society, and Politics. New York, The Free Press; 334pp. As an American who lived during the 70s in what is currently one of the most right-wing areas of the country (and maybe the world), Dallas, Texas, I have to say that Frye boots were not explicitly associated at the time with country-and-western music, but more with the easy, natural-looking, workwear-based, practical, but high fashion styles that were in at the time. They undoubtedly had Western detailing on them, usually anyway, but they weren’t worn with the cowboy-ish clothes that would be faddish briefly at the end of the seventies via Ralph Lauren, let alone with the more reactionary cowboy looks that would become popular in the US in the nineties and remain popular today (Wrangler jeans, Western-yoked shirts in garish American flag prints, etc). There were even Fry boots in patchwork leathers that almost looked hippy-ish. Though country-rock (The Eagles, Fleetwood Mac, etc) and “outlaw country” or “hippy country” (Willy Nelson, Kris Kristofferson, etc) was popular in the US of the seventies, the clothes those performers wore were mostly derived from the hippy styles considered standard for rock stars at the time, maybe with cowboy hats, big buckles, and cowboy boots added, and the country music of the time was not of the flag-waving, sniper-praising kind that plagues the US today. 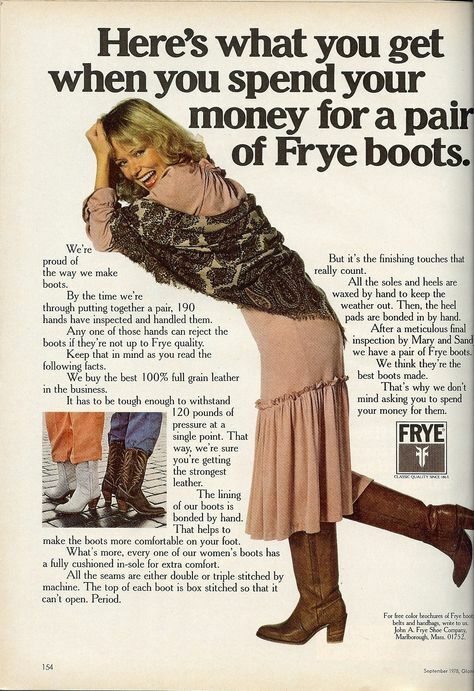 Frye boots where I lived were worn by women with knee-length gauchos or culottes, cowlneck sweaters or hooded tops, vests, denim a-line skirts to just-below-the-knee, and striped t-shirts, not really Western at all. And when men wore them, it was usually with jeans tucked in and a plaid shirt or pullover or t-shirt – again, not really C&W at all, especially when you recall that men at the time wore their hair long, blow-dried, and layered/feathered in styles that would be unthinkable today, especially with the US C&W crowd. It’s probably controversial to say this these days, but there was no explicit, obvious move to the right in popular US society at the time the way there would be later under Reagan, and people weren’t overcome by the fabled “malaise” that people today say characterized the seventies. It was an era which, by current US standards, was almost unbelievably liberal and egalitarian, an era before Reagan had turned the US population against the very idea of government social services, increased the numbers of and demonized the poor, and created the modern plague of homelessness, an era when people could see that the social movements of the previous decade and a half had had many salutary effects – increased social services, reduced militarism, an aversion to violence, increased equality, more rights for women, blacks, indigenous people, serious investigative journalism, more consumer protections, more environmental protections and environmental awareness, on and on, much of it now reversed starting with Reagan’s heavyhandedness in 1981. While scholarship has revealed moves to the right during the seventies especially in places like southern California, where the US’s anti-taxation movement started, that had not yet caught on nation-wide and was not broadly felt in popular culture. That wouldn’t come full force until the eighties. Back to the subject of Frye boots, I’ve also heard, though I don’t know for sure, that Frye-style boots (or the Dingo brand equivalent) were also popular in Australia during this period, and Australia during part of the seventies was headed by Gough Whitlam, who initiated many programs that would see the country move to the left and more justice and liberalism. How does that square with Fry boots being a sign of increased “conservatism” in society? Also, if the connection between Fry boots and the right is being based on their supposed Western inspiration, some Frye boots didn’t have Western detailing and were pretty plain. 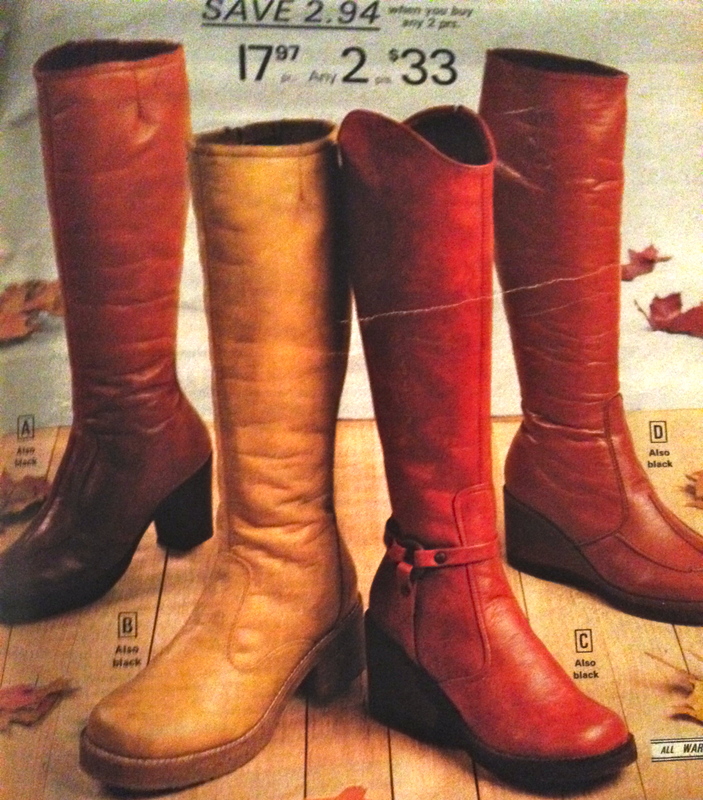 As I recall, the plain ones were the most common in Dallas where I lived, usually in a buff/beige leather. Doc Martens would also become popular in the US, but not in the seventies. Those didn’t become widely worn in the US until the end of the eighties and early nineties, when they became so common that people referred to them by shorthand terms like D.M.’s and Docs. They could easily fit into the definition of fashion boots, at least those that were boots and not shoes, because during their peak of trendiness, they were available in all sorts of bright colors and even prints and were worn with all sorts of clothes, even dresses. I did first seen them worn by British punks, though, in magazine pictures from the late seventies, though I didn’t yet know what they were called. I was also greatly pleased that you brought in the Australian angle, which I hadn’t considered. Of course, Whitlam’s political career came to an abrupt end in 1975. After his removal, which was contentious to say the least, it was expected that he would be re-elected on a wave of public support. In fact, support for the ALP tanked and their opponents won the largest majority in Australian history, which suggests that maybe progressive politics were less than popular with the “ordinary” Australian. Fundamentally – as I’ve said before – Fryes are not something that I was familiar with growing up. So it’s good to get a ‘native’ perspective. Thanks once again. I love this blog. I’ve said this before, let me say it again-this blog is not only good, it’s important. With that out of the way let me say that as an American of roughly the same age as deang but from Southern California, I have to agree with virtually all of his socio-political observations. The Orange County birthed SoCal conservatism was a complete non-factor in my home town a mere 30 miles east. Since that wave spread across the country, its easy to overstate it’s influence. At the time it was just rich people who wanted to keep more of their money(and owned a newspaper that helped them spread their message). From my vantage point (admittedly a gangly high-school vantage point) the Frye/Dingo/Zodiac phenomenon was completely, intentionally non-political. I can see that mini-skirts and knee boots were a statement of sexual independence and Docs were a middle finger salute to the status quo (esp when all your friends were wearing them). I think Fryes were worn as part of the post-Watergate/Vietnam apathy towards anything that smelled of politics. You can infer meaning from the back-to-earth casualness of that part of the non-disco 70’s. But I don’t believe that Fryes were a conscious statement, rather they were just fashion. One other observation, as deang noted, in the US, Docs didn’t make significant headway into the punk rock scene until the mid-80’s at the earliest. In California at least the Engineer boot was the iconic boot of the punk rock movement in the 70’s and early 80’s. I was deeply immersed in the scene and just about everybody I knew owned a pair of Engineer’s and I can’t think of anybody who owned Docs. If we thought of Docs at all they were those Pete Townsend boots. Well that’s what I get for trying to stretch a sociopolitical point too far; maybe I should have stuck to my original idea that it was all about back-to-the-land escapism. In mid-seventies Britain there was quite an enthusiasm for all things American, but it never extended to Fryes – although it did encompass a fair amount of country music. So maybe that reinforces the point that you and deang are making. I also should clarify that, when I mentioned Doc Martens being worn in the late eighties and early nineties, I wasn’t just referring to punks wearing them. Punks had been wearing them since the late seventies in the UK, but back then they were the only ones wearing them as far as I knew, except for construction workers and other workmen, and the shoes were so unfamiliar to me that my Texas self didn’t know they had a special name. In the late eighties/early nineties, though, Doc Martens had become mainstream popular even in the US and you would see everyday people wearing them with conventional dresses, baggy knee-length shorts, even cycling shorts. As I recall, this wearing of chunky workshoes with everything was given increased exposure in the fashion layouts of Ray Petri and his Buffalo group for UK’s “The Face” magazine in about 1983-84 and then caught on. Of course, that means non-punk club kids and the avant-garde on London’s streets were probably already wearing them that way (and of course the workmen the shoes were designed for preceded even the punks by a long margin, though that probably wouldn’t be considered fashion). It’s also not clear to me that punk was left/liberal in orientation overall. It was kind of scattered, with the overall attitude being simply and shallowly one of opposition to the prevailing music styles of the time and that was all. They were even opposed to the virtuosic musicianship that characterized music in the pre-punk seventies. Politically, they were all over the map, with their anti-hippie attitudes causing them to lean somewhat to the right in a lot of cases, particularly in the US. But that’s not what this blog is about, and I know where you’re coming from when you characterize punk that way. I’m quibbling again. Sorry to go on, but it’s so rare to find anyone talking about these things that it’s kind of stimulating. A very good blog, as bruce says above. Just to expand a little… as you’ll know, I’m no historian – although I do have an interest in history just as I have an interest in fashion. But I have an actual professional interest in how you pull together different sources of information to make wider inferences. Reading various works on fashion history, it occurred to me that no one had really done this for the fashion boot. Most of what’s been written relates to big-picture generalities – “in the sixties, boots were worn with miniskirts,” etc. I thought, given the amount of stuff that’s available on line now, that it was possible to do better than this and actually get some hard data. But you’d also need to go beyond raw numbers and look at the potential societal reasons why boots (as much as other fashion items) go in and out of popularity. This is complicated, and a lot of what I write is just speculation on my part. In my “day job” we rely on peer review to tell us when our ideas are seriously off base. You and Bruce and the other people that take time to read and comment on this blog are my peers, and I’m very grateful to you. Without your input, I’m just some guy voicing his opinions.